Sigmundur Gunnlaugsson – the first of many? Iceland's Prime Minister Sigmundur Gunnlaugsson has resigned over documents in the so-called Panama Papers, which revealed details of his family's tax arrangements. 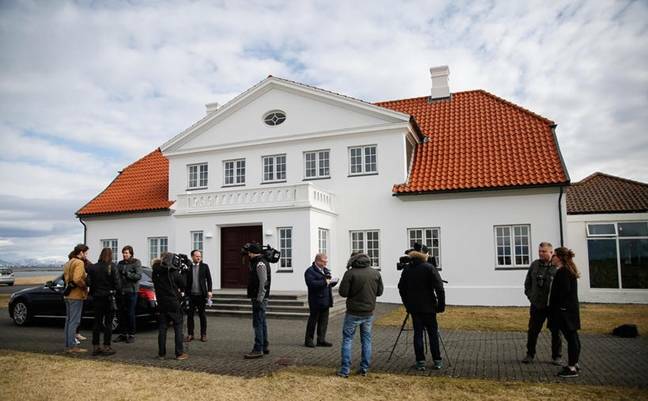 Sigurdur Ingi Johannsson, the deputy chair of the Prime minister's Progressive Party, stated that Gunnlaugsson had resigned on Tuesday on Iceland's national public service broadcaster RUV. The decision came after a frantic last few days day in Icelandic politics after part of the email leak was made public. Over the weekend, Gunnlaugsson gave a car-crash interview in which the documents from the Panama Papers were handed over. He was visibly shocked and stormed out of the interview after a few moments, but the broadcast caused locals to organize protests via social media. On Monday an estimated 15,000 citizens out of a total population of 330,000 jammed up the streets around Iceland's parliament in a peaceful protest against the prime minister. Protestors vowed to return the next day, but it appears the ruling government's nerve has cracked. On Tuesday local media reports Gunnlaugsson asked Iceland's President Ólafur Ragnar Grímsson to dissolve parliament and call snap elections, to be held in the next couple of months. The president refused the request, and Gunnlaugsson has now fallen on his sword. The claimed use of Panamanian shell companies by Gunnlaugsson's wife to avoid taxes, and the prime minister's undeclared investment in the scheme, have caused outrage in Iceland. Part of the hidden investments included local banking stocks and that's a sore point for Iceland, which was nearly crippled in the 2008 financial crash. Unlike other countries, Iceland refused to take responsibility for commercial banking losses, since they amounted to seven times the country's GDP. Instead they jailed over 20 bankers on financial charges and Gunnlaugsson has been involved in negotiations to repay some funds to foreign investors. This is the first head of state's scalp for the 2.6bn-item haul taken from the servers of Panamanian legal firm Mossack Fonseca, which appear to show widespread tax avoidance by senior political figures around the world. The stolen files were leaked to German newspaper Süddeutsche Zeitung, which shared them with the International Consortium of Investigative Journalists (ICIJ) to split the workload. Last weekend, the first installment of the papers was put online, detailing how the rich and famous are stashing their cash overseas. There are 11 other national leaders mentioned in the documents, including Russia's Vladimir Putin, President Xi Jinping of China, and the father of UK PM David Cameron. 143 other world politicians are also named in this batch of files, including two Icelandic cabinet members.